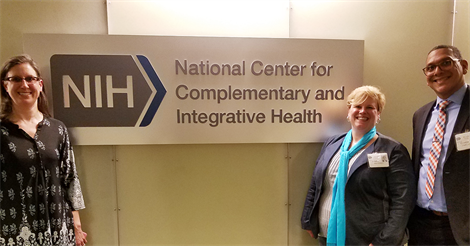 On March 14, 2018 representatives of the American Massage Therapy Association (AMTA) met with staff at the National Center for Complementary and Integrative Health, part of the National Institutes of Health (NIH). Researchers Ann Blair Kennedy and Nikki Munk, and AMTA’s Director of Government and Industry Relations James Specker met with David Schurtleff, PhD, acting director NCCIH, Wendy Weber, ND, PhD, MPH Branch Chief (acting deputy director) and other senior staff to discuss the importance of finding more researchers to submit grant proposals on the efficacy of massage therapy. Over the past 20 years, AMTA has had many interactions with the NIH, but this meeting focused on the necessity of increasing the amount of massage therapy research, as massage therapy has become more accepted as an important approach to managing pain.